Join leader Rick Hinterthuer for a trip to Sweden Creek Falls Natural Area, an Arkansas Natural Heritage Commission Natural Area, located in Madison County’s Boston Mountains. The area comprises a rich mix of wooded slopes and ridgetop sandstone glades, with an 80-foot waterfall as the (seasonal) centerpiece. The easy to moderate trail is 1.5 miles, round trip. Take a look at the Arkansas Natural Heritage Commission website for details. Directions: From the town of Boxley take State Highway 21 north. At 4.0 miles turn left (south) onto a dirt road and proceed 3.0 miles to a gate on the right. The road is closed to vehicle access, but visitors can park in the gravel lot near gate. Time: Rick will meet you at the gate at 10 a.m. Contact Burnetta Hinterthuer at burhint@sbcglobal.net for more information. Membership in this Society is open to anyone interested in the native plants of Arkansas. Click here for information on joining. 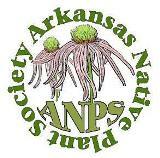 The fall ANPS meeting on October 12-14 is a great way to spend two days exploring Arkansas with other members. Fall meeting details and more field trip information can be found on the Arkansas Native Plant Society calendar. This entry was posted in Field Trips and tagged Arkansas Natural Heritage Commission, Sweden Creek Falls Natural Area. Bookmark the permalink.